I read a brilliant book the other day called “The Happiness Hypothesis” by Jonathan Haidt. Although Positive Psychology has been claimed to be the ‘Science of Happiness’ – I’m not someone who thinks happiness is something you can search for, it’s something you have to work for, it takes effort, time and a true understanding of what makes you, personally feel good. Without investigating this within yourself, happiness is something you’ll always strive for, but not really know how to get. Yes, I just said ‘uncontrollable elephant’ – the writer talks about the two sides of our brains – our unconscious decision making – our ‘gut brain’ as he calls it. The actions of our gut brain ( the elephant!) are autonomous, they cannot be directed by rational decisions. Then there’s the other side, the rational decision maker, the thinker. The metaphor he uses is the gut brain is an uncontrollable elephant being ridden by a rational decision maker. However, the rational thinker doesn’t have all that much control over the elephant as you can imagine. 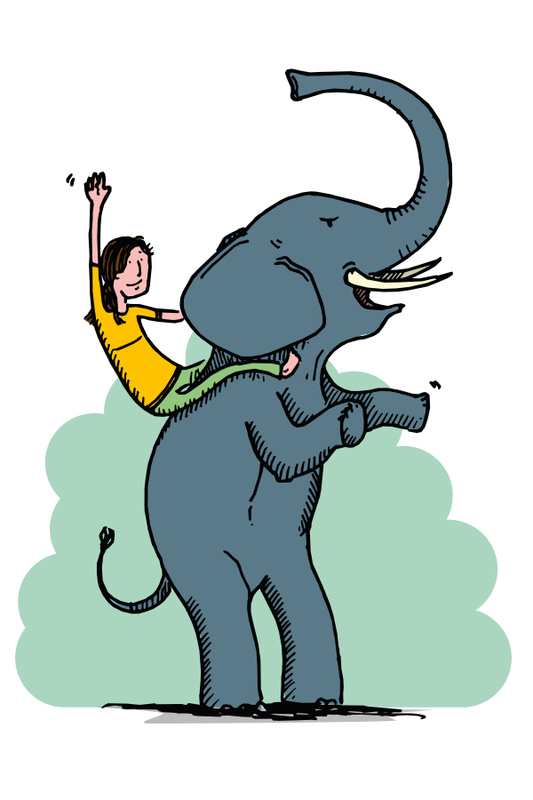 Although our rational rider can plan and give clear direction in the way we’d like our gut brain to behave, we usually allow our emotions to direct us – therefore the elephant in our metaphor tends to be more powerful than the rider. So what does this mean to us as mums? Well firstly, we should stop beating ourselves up for the way we feel! This is something we cannot control and each time we try, we are effectively reinforcing the negative. I once read a book called “Don’t think of purple spotted oranges” which even by reading the cover, you’re thinking of purple spotted oranges. The more we tell our brains NOT to do something, we focus on doing it. So stop trying to control those emotions and accept them when they come. Learn to employ techniques to find ways to dispute them instead. This is a big one for me within motherhood, we spend a lot of our time ‘pretending’ to be ok and to be coping when really we’re screaming for help. The media tells us we should be able to cope, that we were built for this and showing weakness is showing failure as a mother. Well, poppycock to that. As humans, we have a deeply ingrained instinct to reciprocate. As mothers, we ALL struggle at some point or another and when we do, admit it. Call your best friend, call you Mum or just open up to someone similar to you. By showing that vulnerability it encourages others to show their vulnerable side too. A lot of why we feel so isolated as Mum’s comes from not sharing enough vulnerability and therefore empathy with each other, instead we chose to judge and comment on how we disagree with their idea of what motherhood entails. Let’s stop doing that, open up, share your worries and encourage others to do so too. How true is this? How many times do we tell ourselves that we should want something when we really don’t or we should behave in the way we’re told to. If our inner elephant is screaming to behave differently, we’re not being true to ourselves. Have a good look at the people you surround yourself with, do you feel drained by some? If so, ask yourself why you still connect with them? Pick those that you always look forward to seeing. I’ll bet that with the ‘drainers’ you feel the relationship is all about you giving and them taking. Whereas the ones who make you feel happy, give as much as they receive. Social connection is such a big part of well-being, choose the connections that truly speak to your elephant! This is such a simple statement but it makes so much sense. We spend a lot of time laying blame at the door of people that make us unhappy, yet spend little time laying thanks to those who make us happy. Remember, we ALL have good AND bad inside us, we all have the ability to be nasty on occasion or say something stupid. So we shouldn’t define people by one mistake. (If it is one…) Whether the good side or the bad side wins is down to which one we feed… but that’s a whole other blog post! So, when people make you feel good, recognise it and feel free to blame them for it! Saying thank you and meaning it is one of the best ways to make you both feel good. Hello! My name is Jeni and I’m a mid-30’s mum of an (almost) two year old and step mum to an 8 & 10 year old. ‘Project Energise’ is my outlet to showcase the progress of my various projects. From Mum to Me – creating an ‘Arrive at Me’ routine.